Languages Aren't Foreign To Us! Get a fast, FREE quote for any language project! Interpreters available 24/7 in 200+ languages! Private, corporate, group and immersion programs. We know the importance of providing our clients high-quality, reliable translation and interpreting language services. Tens of thousands of corporate, government and private clients have trusted us to deliver their message accurately and quickly to clients throughout the Phoenix area for 20 years. Our team of language professionals has experience and a proven track record of success in every industry and language. Whether you need a translation of your company website into Chinese and French, a deposition interpreted in Spanish or anything in between, we have all of your language needs covered! In addition to our translation services, we provide consecutive and simultaneous interpreters for corporate and government conferences, hospitals, medical facilities, nursing homes, courtrooms, law enforcement and social service agencies. We also offer telephone interpreting, as well as American Sign Language (ASL) interpreters onsite or through video remote interpreting (VRI) 24 hours a day, 7 days a week. • Certified translations: Business communications, company websites, contracts, personal documents, such as birth certificates and academic transcripts, software localization, product packaging and more. • Foreign language and English (ESL) instruction: onsite corporate classes and virtual instruction in nearly any language, including ASL. 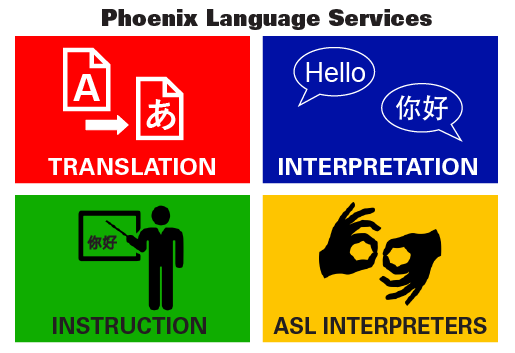 Give us a call to learn more about our translation and interpreting services or email phoenix@indytranslations.com.